Hear the report by KUAR Intern Jackson Floyd. The hottest days of the 2018 summer in Arkansas may still be ahead according to projections by the National Weather Service. Summer months are often characteristically humid and hot, which is no surprise to residents. However, the excessive heat can be damaging to personal health. NoHeatStroke.org is a service of San Jose State University’s Department of Meteorology and Climate Science which tracks reported cases of pediatric vehicular heatstroke deaths across the country. Between 1998 and 2017, 17 children under the age of 14 have died in Arkansas after being left in a vehicle during hot weather. This ranks the state within the top 20 in the U.S. 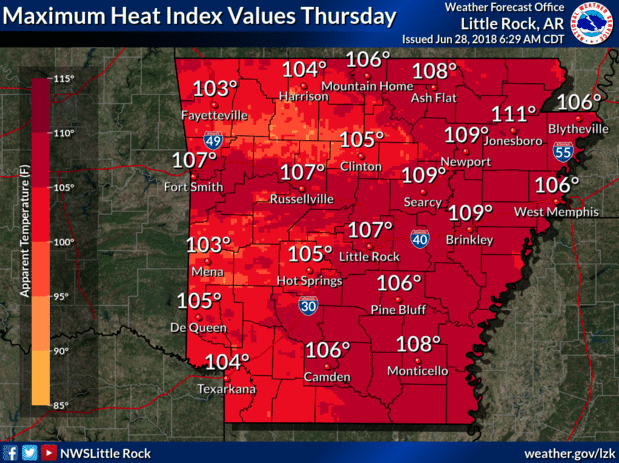 When heat advisories have been issued, the city of Little Rock has been responding by opening public cooling centers at local community centers. These spaces provide a place to escape from the heat at its worst. Tye Forte, facilities manager at the West Central Community Center, said the centers have helped provide shelter as necessary. "It’s a great opportunity to get some good air, get out of the heat. It’s very dangerous when it gets that hot," said Forte. "We also have food and water, all types of things to keep you going." Communities in rural areas are also struggling to deal with the burden of high temperatures. Arkansas farmers have been careful to maintain the health of their livestock and crops during the summer. Dr. Vic Ford with the University of Arkansas Cooperative Extension Service says it's a pressing issue when it comes to taking care of cattle, particularly cows. "They’ll be seeking shade, and in high heat, the cows will not eat," Ford said. "If they don’t eat, they will not gain weight and the farmers will have less market value for them when they decide to sell them for the final harvest. All these factors contribute to stress in the cows we’re growing." According to Ford, another issue faced by farmers during the summer is finding reliable irrigation methods for crops. He says the season is a challenge, but also provides an opportunity to experiment and discover which procedures work best. "We’re looking at new irrigation technology as well as our educational program so that these hot, dry temperatures can be alleviated through irrigation," said Ford. "Even with the declining water table, which is a big concern, we’re looking at methods that will more effectively reduce water use during these high temperatures. We’re looking at both drip irrigation, which is very water saving, and traditional methods." During periods of extreme heat, it is recommended that people only venture outdoors when necessary, avoid direct sunlight and stay adequately hydrated.